In November, 2016, the new zoning for townhouses on the Orchid Bend property has been lost due to inaction by the owner. The land has been returned to Agriculture use only. The land was sold to Kristi Lacy Bessio and Andrew Bessio. The Bessio’s are clearing the land. Kristi Lacy Bessio owns Lacy’s Landscaping in Boynton Beach, Florida in December 2016. If you questions, contact Kristi Lacy Bessio at kristi@lacyslandscaping.com her business phone (561) 965-0080. The legal address for complaints to the County is 5401 Lake Ida Road. 24 Townhouse Style Condos on Lake Ida Road between Sims Road and Bridgeview Development. Currently the land is an abandoned nursery. The Board of County Commissioners approved the development on October 22, 2015. Plans had been recommended for approval by Palm Beach County Zoning Commission on October 1, 2015. Special conditions of approval were required by the County Commissioners. Below is a list of the requirements above the Unified Land Development Code. — 30 foot wide landscape buffer and a six foot tall vinyl coated chain link fence at the property line with Ferndale Drive. — A wider landscape buffer with vinyl coated chainlink along parts of the road edge. — In addition to the normal tree requirements, another (1) palm or pine for each for each thirty (30) linear feet of the property line will be added. — Deed over to the county any land required for a 110 foot wide road. — Provide the County a legal easement of driver sight lines. 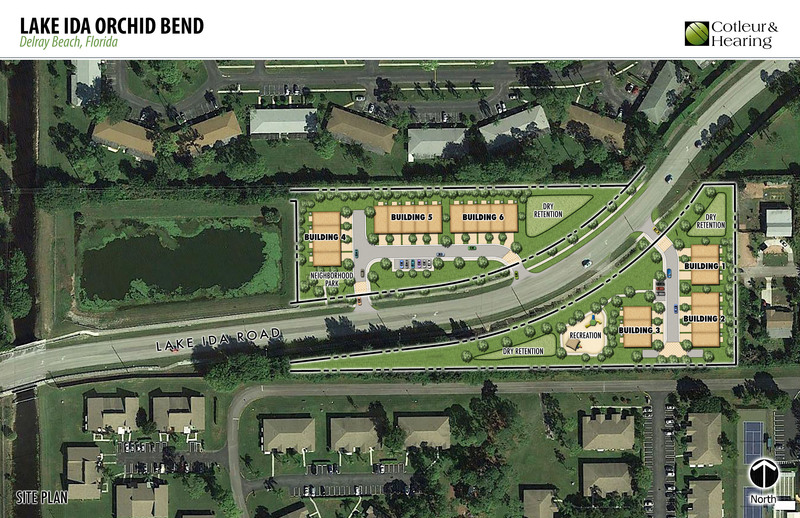 Expand Right-of-Way for Future 4 Lanes on Lake Ida.